So Red the Rose is a 1935 motion picture drama directed by King Vidor. The Civil War-era romance is based on the 1934 novel of the same name by Stark Young. The movie did not enjoy great popularity at the box office. 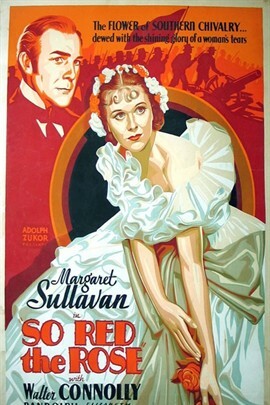 Afterward Civil War films were considered box office poison in Hollywood until Bette Davis and Henry Fonda's performance in 1938's Jezebel, which was a success. This was followed by the overwhelming popularity of Gone with the Wind in 1939, an adaptation of Margaret Mitchell's bestseller of the same name.